I recently learned that cells are extremely crowded and busy places. I knew there's a lot of activity in cells, but I didn't realize just how much until I was reading Molecular Biology of the Cell . I was reading this molecular biology textbook to find out what's happened in molecular biology in the last decade or so, and found I had some misconceptions about how fast things happen inside cells. I imagined cells as big open spaces with lots of stuff happening, perhaps something like Central Park. From the "Inner Life of a Cell" video, or the typical drawing of a cell, it looks like a lot of empty space. But it turns out that cells are crammed full of stuff, more like New Year's Eve at Times Squares. Proteins are packed tightly into cells. 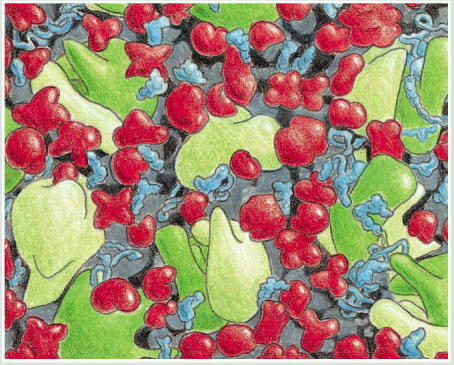 The following picture is a representation of how crowded cells really are, with blue RNAs, green ribosomes, and red proteins. 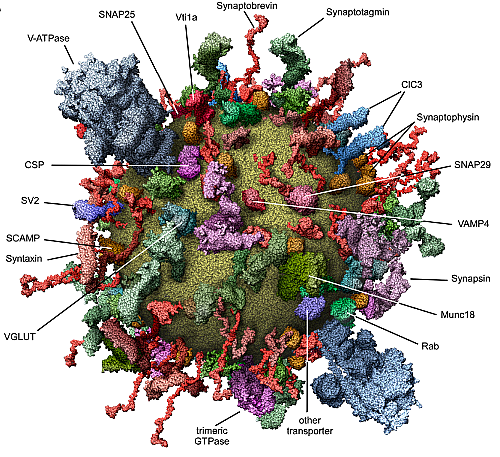 Image: "The structure of the cytoplasm" from Molecular Biology of the Cell. Adapted from D.S. Goodsell, Trends Biochem. Sci. 16:203-206, 1991. I came across another interesting representation of how crowded cells are. This diagram shows a synaptic vesicle, which is the part of a neuron that releases neurotransmitters from one neuron to another. When I saw this diagram, I assumed that the authors crammed all the different proteins into the picture so they could create a nice illustration of the different membrane proteins. But in fact, the diagram below omits 1/3 of the proteins so real membranes are even more crowded. The paper containing this diagram states that instead of thinking of membranes with proteins floating in them like icebergs, we should think of membranes as packed with proteins like a cobblestone pavement. Image: "Molecular Model of an Average SV" from Molecular Anatomy of a Trafficking Organelle, Takamori et al, Cell. 2006 Nov 17;127(4):831-46. You may wonder how things get around inside cells if they are so crowded. It turns out that molecules move unimaginably quickly due to thermal motion. A small molecule such as glucose is cruising around a cell at about 250 miles per hour, while a large protein molecule is moving at 20 miles per hour. Note that these are actual speeds inside the cell, not scaled-up speeds. I'm not talking about driving through a crowded Times Square at 20 miles per hour; to scale this would be more like driving through Times Square at 20 million miles per hour! Because cells are so crowded, molecules can't get very far without colliding with something. In fact, a molecule will collide with something billions of times a second and bounce off in a different direction. Because of this, molecules are doing a random walk through the cell and diffusing all around. A small molecule can get from one side of a cell to the other in 1/5 of a second. As a result of all this random motion, a typical enzyme can collide with something to react with 500,000 times every second. Watching the video, you might wonder how the different pieces just happen to move to the right place. In reality, they are covering so much ground in the cell so fast that they will be in the "right place" very frequently just by chance. In addition, a typical protein is tumbling around, a million times per second. Imagine proteins crammed together, each rotating at 60 million RPM, with molecules slamming into them billions of times a second. This is what's going on inside a cell. I'm not blaming the makers of "Inner Life of a Cell" for slowing down the action in a cell. If the video were totally realistic, you wouldn't see anything, since the action would be too fast to even see a blur. But keeping the real speed of the cell in mind can clear up a lot of things, such as how molecules find their way around. The incredible speed and density of cells also helps explain why it's so difficult to simulate what's happening inside a cell. Even with a supercomputer, there's way too much going on inside a cell to simulate it without major simplifications. Even simulating a single ribosome is a huge computational challenge. Another thing that surprised me about cells is how fast the motors inside cells move. Like a mechanical robot with two lumbering feet, a kinesin motor protein can be seen in the video at the 2 minute mark dragging a monstrous bag-like vesicle along a microtubule track. (This should be what you see in the YouTube preview frame at the top of the page.) These motor proteins move cargo through the cell if diffusion isn't fast enough to get things to their destination, which is especially important in extremely long cells such as neurons. Kinesin motors also help separate cells that are dividing. It's remarkable enough that cells contain these mechanical walkers, but I recently learned that they aren't plodding along, but actually sprint at 100 steps per second. If you watch the video again, imagine it sped up to that rate. Mitochondria also provide a fascinating look at just how fast things are inside cells. You may know that mitochondria are the power plants of cells; they take in food molecules, process it through the famous citric acid cycle, and then use oxygen to extract more energy, which is provided to the rest of the cell through molecules of ATP, the cell's "energy currency". Mitochondria have many strange features - such as their own DNA separate from the cell's - but one of their strangest features is they use electric motors to produce ATP. Mitochondria use the energy from oxidizing food to pump protons out of the cell, creating a voltage of 170mV across the cell. This voltage causes a complex enzyme to spin, and the mechanical energy of this spinning enzyme creates the ATP molecules that energize the rest of the cell. The same Harvard group that created "Inner Life of a Cell" also created a two minute sequel, "Powering the Cell: Mitochondria", which shows mitochondria in action. Around the 1:10 mark, the video shows the rotating ATP synthase enzymes creating glowing ATP molecules. Watching the leisurely turning enzymes illustrates one of the amazingly complex mechanisms in a cell. But what really surprised me was to learn that in real life, these enzymes spin at up to 700 revolutions per second, which is faster than a jet engine. As I said earlier, cells are really, really fast. If you're interested in more about this mechanical motor, you'll probably enjoy PDB's molecule of the month article. The molecules inside a cell are moving almost unimaginably fast. Understanding this speed helped me comprehend how cells could carry out all their tasks, and how the different components of a cell could manage to be in the right place at the right time. Not sure how I got here. But def a very cool writeup. Thanks for putting your time into it! Echoing the same comment. No idea how I got here but thoroughly enjoyed reading it and appreciate the work you put into it, awesome. Awesome article Ken! I'm doing electronics workshops with kids so I got the idea about comparing electronics to how the cell works... it could be interesting. Excellent write up. After reading A Short History of Nearly Everything, it cleared up what I thought I knew with the animations on YouTube. Fascinating. Great job. Fascinating and terrific. Another way to view this is that we (whole organisms) move and think very slow. Part is due to differences in scale: small things fast, big things slow. As you point out, since cells are fairly small, relative speed is very different. Here’s a question I’ve asked of physiological friends: voluntarily move you arm from straight to flexed. Takes perhaps half a second. Movement might be 1 foot. How many actino-mycin couplings and decouplings have occured? What is the rate? MB of the C was one of the set books for my Biochem degree, way back in the 1980s. Still dip into updated versions from time to time.